“I've been a fan of the various incarnations of Crooked Necks since 2007, back when they went by the name Frail. Their Brilliant Darkness demo, which is also getting the remaster-and-re-release treatment from Handmade Birds, absolutely floored me, who had only otherwise heard this style of music from bands like Amesoeurs. Of course, like many fantastic bands before them, I didn't hear anything more from them for a few years. From my understanding, they released a super-limited cassette of Joy Division covers (protip: Something Must Break is also set to be released from Handmade Birds as well, joy! ), but it never received any real attention or the standard ‘rip the cassette and post to blogs’ that the previous release and the band remained silent...until last year. After the announcement of their name change to Crooked Necks, from their song "Crooked Necks and Uneven Strides," they released an impressive split with none other than Circle of Ouroborus, one of my favorites, and now, after years of anticipation, Handmade Birds brings us this trio's first full-length recording, aptly titled Alright Is Exactly What It Isn't. 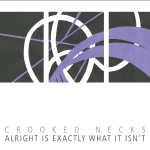 In a sea of bands who try to sound like the next big thing, Crooked Necks truly sets themselves apart with Alright. For one thing, though this description is found throughout the subgenre, it is absolutely gorgeous. The subtle, bittersweet textures built by wayward, meandering guitars bring about mental pictures of fading memories of road trips with friends, sunsets with loved ones, happy times that one might look upon when one is sad. The fragility of quiet, clean guitars, smooth bass and subdued drums beneath shrieking voices (quite the striking contrast) brings to mind that something is definitely wrong, because, after all Alright Is Exactly What It Isn't. The subdued, repressed emotion found throughout the album can be represented by a man on the brink, covering up his rage and self-hatred with a facade but slowly teetering towards the inevitable emotional breakdown. When ‘Every Step Feels Backwards,’ he will ultimately break and he very well knows it, but will try his hardest to retain his composure; an empathetic exercise in daily life.